Soft plastic #6, including styrofoam and plastic bags, is currently not recycleable in San Luis Obispo County and should be put in the garbage. Rigid plastic #6 can be recycled. Packing peanuts and bubble wrap are plastic #6, so they are generally not recyclable. There are many alternatives for recyclable packaging material. Find out how to dispose of packing peanuts or bubble wrap. 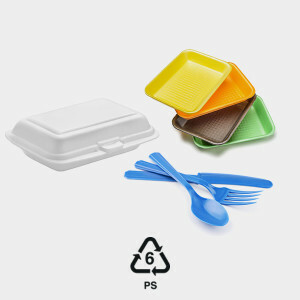 Foam takeout containers are made from plastic #6, so they are generally not recyclable. Even where some foam products are recycled, takeout containers are often not accepted because they are difficult to sanitize. Plastic #6 is a lightweight material that easily finds its way into the environment, where it can leach toxic chemicals. Visit Home for Foam to see if there is a foam recycler in your area. These recyclers will accept many foam products, including beverage and food containers. Find out more. Send your foam peanuts and hard packaging to EPS Industry Alliance Packaging, which offers a foam recycling alternative. Find a drop off location or mail in clean foam packaging to the nearest collection facility. Use foam to refill cushions or stuffed animals that have lost their loft. You can also use foam to line the bottom of your potted plants—you won’t need as much soil and it will allow water to drain easily. In the ocean, plastic is being consumed all the way down the food chain. For the first time ever, scientists have recorded plankton eating tiny polystyrene beads. Find out more at New Scientist. Styrene, a component of polystyrene, has been found in 100 percent of human fat tissue samples dating back to 1986. It is known to cause cancer in animals, and suspected to be both cancerous and a neurotoxin for humans. Find out more from EJnet.org.